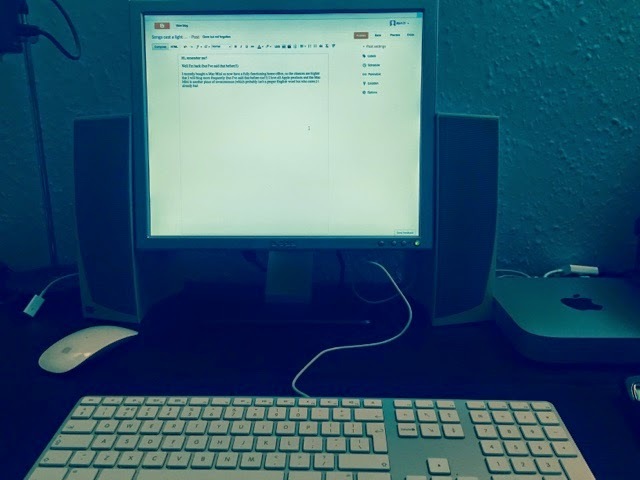 I recently bought a Mac Mini so now have a fully functioning home office, so the chances are higher that I will blog more frequently (but I've said that before too!!) I love all Apple products and the Mac Mini is another piece of awesomeness (which probably isn't a proper English word but who cares). I already had a monitor, and an Apple mouse and also invested in a wired keyboard, which has a numeric keyboard which will help with work. I needed speakers as the one in the Mac Mini is not its best feature and having researched extensively on Amazon, I then saw an old pair on the top of a wardrobe and they are just fine and dandy. I do now, however, keep getting "speaker suggestions" popping up on Facebook and the like!! Let's see how long this ride lasts!! Yesterday I saw a record set that may never be broken!! Through a set of circumstances that started with old friends getting together for a coffee, I ended up going to the last game of the season at St Mary's. Saints were playing Aston Villa with both teams needing three points. Saints are hoping to finish in the top 6 (just writing that feels so good!) and despite having reached the FA cup final in a couple of weeks, Aston Villa could still be relegated to the Championship. Saints have suffered a dip in form recently and Villa have been on a good run following the appointment of Tim Sherwood as manager, so a tough game for Saints was likely. Well how wrong was that! Saints started very well and had a goal disallowed (incorrectly) for offside in the first 5 minutes. Then Graziano Pellè was through with only, Shay Given, the Villa goal keeper to beat, but Given stopped his shot. After a warning that Villa could be dangerous on the break. Saints took the lead when Sadio Manė took a headed pass into the Villa area, he rode one tackle, held off another and shot at the keeper, who saved the shot. The ball however, bounced behind the keeper into an empty space and Manè was able to tap the ball into the goal, 1-0!! A minute later, Manè broke down the right wing and played a lovely through ball to Shane Long, who was in on the Villa keeper. As Given dived at Long's feet and appeared to foul Long, the ball was diverted sideways and Manè was quickest to fire the ball into an unguarded goal for 2-0! Another minute later, the Saints worked a flowing series of passes down the left side of the Villa defence which ended with Shane Long clear on the left side of the penalty area. He looked up, saw Manè on the right side of the box and squared the ball across for Manè to volley the ball past Shay Given, 3-0!!!! All of which means that Sadio Manè scored a hat-trick in 2 minutes 57 seconds, which is the fastest hat trick ever in the Premier league. The previous one was 4 minutes 22 seconds by Liverpool's Robbie Fowler, a record which most pundits and players thought would never be broken! Well they didn't reckon on Sadio! For the record Shane Long scored two more in the first half, the second of which was a 35 yard volley! Villa scored right before half time, so it was 5-1 at half time! With all that excitement in the first half, it was likely that the second half would struggle to match the first and that proved to be the case. 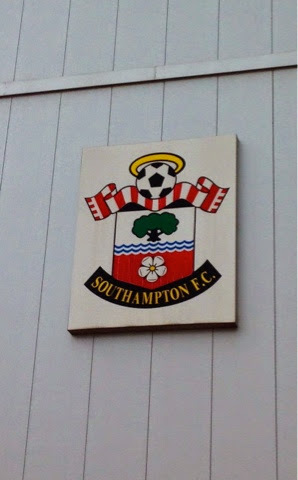 Saints did score one more goal through a great finish by Graziano Pellé so the game ended 6-1 to the home side. Europe looks more likely for Saints and despite this result Villa are safe from relegation as other results went in their favour. Finally a big thank you to my friend Dawn, without whom I wouldn't have been there to witness a football record being set that should stand for a long time. For what it's worth, here are my Premier league predictions! So it is two days before the start of the new Premier league season. It's fair to say that preseason at St Mary's has been anything but quiet! The Saints have sold Rickie Lambert, Adam Lallana, Luke Shaw, Callum Chambers, Dejan Lovren and Dani Osvaldo has gone to Inter Milan on a Season long loan. Or other words we've lost our main striker, main playmaker, three of our starting back four and a lunatic who we were happy to see the back of. That three of those players have gone to Liverpool is also unusual and of course our first game is away to Liverpool! But it has to be said that Liverpool have paid well over th odds for both Lovren and Lallana. In addition the money that Arsenal played for Callum Chambers was also ridiculous. To replace these players the club have used the knowledge of new manager Ronald Koeman and bought in Graziano Pelle and Dusan Tadic from Dutch football as replacements for Lambert and Lallana. From preseason matches both look like adequate replacements. We've also bought Shane Long from Hull City to play off Pelle and hopefully they will quickly form a free scoring striking partnership. In defence we bought new goalkeeper Fraser Forster from Celtic. At six foot seven and an England international he appears to be a good buy. We've also taken Ryan Bertrand on a season loan from Chelsea and today have bought Florin Gardos from Steaua Bucharest who is an international centre back. Finally as part of the deal that took Osvaldo to Milan we've taken a defensive midfielder Saphir Taider on loan to St Mary's. Both of the loan deals mentioned are believed to have clauses which allow us to make the loans permanent transfers at the end of the season. So on paper we seem to have replaced all the players that left with equivalent replacements. We also have more players coming through from our wonderful Academy, so the season ahead, which could have been a complete disaster, at least now looks like it will be ok.
Where do I think we will finish? Somewhere between 10th and 13th. If Koeman gets the team playing as a team sooner rather than later we could even match last years eighth. But equally if the team doesn't gel quickly enough then below 13th could be the alternative. These may be famous last words but I don't see us being in the relegation battle. That's especially true after Crystal Palace let Tony Pulis leave today! A good start would be three points at Anfield! I first got into listening to the music of the progressive rock band "Yes", when my friend Nigel played me Yessongs (probably while we were playing "Risk"!). Since then their music has seen me through good times and bad & given me some of the most exhilarating musical experiences of my life. When they're on form there are not many other bands who can touch them. I've seen them live four times, all were really good concerts. To most Yes fans the classic lineup (Anderson, Howe, Wakeman, Squire and White) is the one that most of us wish was still talking to each other and therefore still touring together. Sadly it appears those days are past, with Anderson touring on his own and Wakeman putting on lavish productions of his previous solo albums. Indeed Anderson & Wakeman will probably work together in the future. The current live incarnation of Yes incorporates Howe, Squire and White, with Geoff Downes who played in an earlier version of the band (when Anderson and Wakelman left previously- but subsequently returned) and Jon Davidson, who like his predecessor was in a tribute version of the band. This version has been touring extensively, the last tour incorporating the playing of Close to the Edge, the Yes album and Going for the One in their entirety. As Yes fans will know the key feature of the live performance was Jon Anderson's vocals, he sings in a distinct falsetto. Jon Davidson has a similar voice and the live versions of these albums were to most Yes fans an authentic rendering of the original material. Now they have gone into the studio to record their new album "Heaven and Earth", this being the first one with Davidson on vocals. Snippets of tracks have been released via Facebook and SoundCloud and in a mixup with iTunes if you preordered the album you got a two tracks free but in fact you seemed to be able to just buy the two tracks without pre-ordering the album! This campaign I think did the band a disservice. I remarked to one of my friends recently that I didn't think I was going to buy the album as what I had heard sounded awful. In fact that wasn't correct. It's not a great album, but it has its moments (Subway Walls is a good addition to the Yes catalogue) most of it is ok and there is only one track that really makes me cringe. As ever with Yes albums, Steve Howe's guitar playing is exemplary and takes some mediocre tracks into okay status just by his playing alone. Davidson's vocals are again okay though his lower register is a little bit iffy in places. The rest of the band do what the rest of the band do to an acceptable standard although I could have done with a bit more keyboards on some tracks, or at least with what was there being a bit higher in the mix. The album is produced by Roy Thomas Baker, best known for his work with Queen. To be honest I expected more from the production than is on display here. It doesn't jump out of the speakers at you, which is what you normally get from his productions. The album was recorded and produced fairly quickly, and I have to say it does sound a bit like that too. It was recorded between gaps in tours and that's never a good basis for a new album. Am I glad they recorded it, not really! Will I play it again and again… probably not. Should they stop making music? No, they should probably just take more time and pay more attention when they sit down to record the next one. They remain fine musicians, the live tours prove that. It's just a shame that what could've been a really good album ended up just okay and that's being a bit generous! Sky have just announced that they're going to add sky sports 5 to their sports package from the start of next season. It's only going to show European football, including the champions league games. It's free to existing subscribers and they can also get two years free sky broadband. That looks like a good deal. But Sky only have the rights to show the champions league for next season. After that they switch to BT sports. At present to get BTSport free you need to be a BT broadband subscriber. So this time next season you might want to switch broadband to BT from Sky so that you can watch the champions league for free that way, or at least with the discount as a BT broadband user. But those clever chaps the Sky have tied you in for two years. So now you'll probably have to pay full price for BTSport to watch the champions league. So you might not bother. Well that's what Sky are hoping anyway. And with that news all the hope and dreams that our club might be really really on the edge of greatness evaporates, All we need now is for Adam Lallana, Luke Shaw and a couple of other key players to leave and all the good work of the 5 years may be for nought. Tonight feels pretty bleak. What really annoys me is that he's gone to Spurs. They finished 6th in the Premier league only two places above Saints (albeit by 13 points). But if we are to progress above the best finish we've ever had, then you don't let your manager go to one of the teams stopping you get higher? We are now in that "second tier" of the league below the Champions league places but battling for Europa league spots and Spurs are also in the tier. Now they have ambitions of a top four finish, indeed MP's stay at Spurs will depend on his achieving that. Is he mad?? The season just finished was the chance Spurs had to break into the top four but they blew it and big time. As three of the top four clubs from the previous season changed managers then there was a real chance that a gap might appear, as it did by United faltering, but that space was taken by the newly reinvigorated Liverpool. So next season the existing top four will only get stronger (Chelsea and City have unlimited funds, Liverpool have European income to spend and Arsenal always have a healthy bank balance). United have a new manager who will sort them out and they will be real contenders again. Add to that Everton who if they add to their squad sensibly will continue to be an outside bet for a top four finish and you have 6 teams already well ahead of Spurs for a top 4 finish. That's a tough job for a team with a settled squad which needs a couple more quality players to mount a challenge (like Everton) but Spurs are a long long way from that position. They only scored 55 goals and they let in 51. That's a lot less scored than the top 5 and more conceded than the top 5 too. (To be fair Liverpool only let in one less goal but as they scored 101 so that didn't matter!!) So both the defence and the attack need major surgery. Spurs sold Gareth Bale last summer and they then spent c£90m on new players so they have a full squad already, which needs to be trimmed to then grow (or they could fall foul of the Financial fair play rules). So that's not a quick fix, that's a long transition. Spurs seem to have understood that as they have given MP a five year deal, but and it's a big but they don't have a track record of giving any of the last 10 managers long enough to deliver that golden chalice of a Champions league place. (It's not helped by Arsenal doing it year after year, but they have stuck with their manager!!!) MP will have some time develop his team but if Spurs are not in the top 6 at Christmas then the clock will be ticking and it will get louder and louder if they remain no better than they are now. All of which will be a crying shame as MP is a good bloke who has developed a team at St Mary's into probably the best team we have ever had and with a couple of good signings could have been on the edge of true greatness. Maybe he should have read Glen Hoddle's CV before jumping across to Spurs? ?